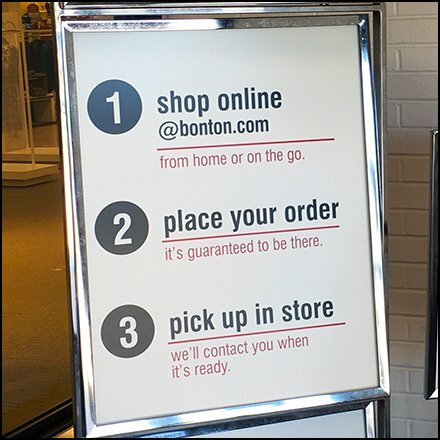 Bon-ton’s entry sign reminds you that Online Shopping In-Store Pick Up As Simple as 1-2-3. So if it’s a “Must Have!” (oops, that’s a Macy’s tag line) select style, size and color online from the convenience of home, then run out for a breath of fresh air and pick up immediately at the store. This Online Shopping In-Store Pick Up As Simple as 1-2-3 promotion seen at the Wyoming Valley Mall, Wilkes-Barre PA.